Who would fit in better at our tailgate party - McCain or Obama? Weber, the grill folks, sent me an email about their latest survey. They do some pretty fun ones. This time Weber asked tailgaters to vote between McCain and Obama as Tailgate Chef for the updating tailgating season. Yes! It is that time again. 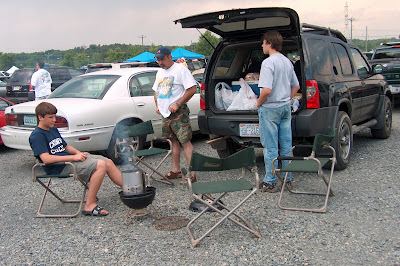 Labor Day marks the offical start of tailgate season. While many of those polled were undecided (or perhaps simply confused), it does appear that McCain has the edge on Obama at 32% to 28% as top pick for barbecue chef. That leaves 21% undecided and 14% picking another candidate. Let's all hope the other candidate is Grill Girl. In looking at the demographics, Obama takes the lead with younger barbecue contest voters. I guess they'd rather hang out with someone who could still throw a football, although perhaps McCain can as well. I have not had the opportunity to play with either - sadly. Men think McCain would be the better pick while women are undecided (splitting about even). Women are probably trying to decide which one would pack and then clean up afterwards. I kind of bet on Obama, since he came from a single parent household. Democrats were more likely to cross party lines, but that's true at parties as well I think. Also, Democrats tend to be pretty down to earth and may figure it would be a good strategy to keep McCain busy while everyone else enjoys the game. If you're wondering who I'd pick to grill up the grub at the tailgate party, hum . . . tough call. I think I'd invite them both and do the grilling myself. So, if you see either of them, tell them they're invited. Feel free to leave your vote! Barack or John? Who do think would rock your tailgate party. I think I'd have to go with Obama. He just seems like a more fun guy to go tailgating with. Hi Joe. Yes. Obama does seem like a fun guy. McCain might be too. Sure would be nice to meet the candidates in person. You can tell a lot about a person at a cook out. Hi Laurie! That would be really interesting. Hum. I can't see Hillary at a barbecue. I will have to think on that one. The media makes her look more uptown or something. I think - hey - let's put her on the guest list too. She might like to let her hair down too. I think I'd have to say Obama between those two, but wouldn't it be more fun to invite Palin instead? She'd shoot dinner for you then clean it, and then cook it on a Weber Q100!